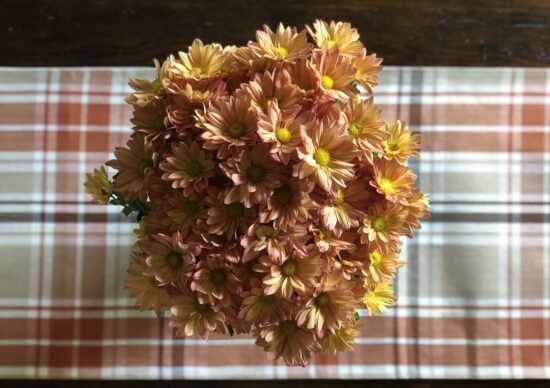 The mums are so perfectly “fall” to me, and I love the color. I had originally put them on the front porch, but the arrangement was a bit too small. They look much better here in our kitchen. 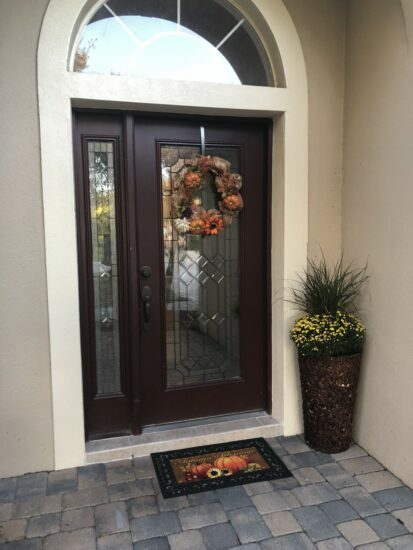 Of course, that left the front porch container bare, and since I also had to go to Lowe’s for a couple of things, I picked up an arrangement there of yellow mums with tall grass in the middle. That fit the porch dimensions a lot better. I still need to grab a brown Sharpie and color in the light spots on the basket/urn thing. The cat used it for a scratching post for awhile, and unfortunately she clawed just a little bit on every side. 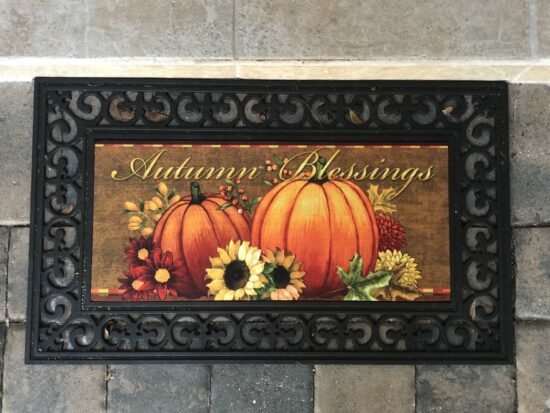 And of course I had to have a fall-themed door mat! The one I’d been using all year had a blue background. By the way, this is the awesome Sassafras doormat. I got mine from Zulily, but they sell it here on Amazon. You can then buy different inserts that you can change with the seasons or just on a whim. I have one for Halloween, another for Christmas, and a third that has our last initial “P” on it. And then I’d bought a Christian-themed one earlier. But I wanted a generic autumn one (no holidays) so I bought this one that reads “Autumn Blessings” from Amazon Prime. Do you just love my wreath as much as I do? My BFF made it too. I’m a fairly minimalist decorator, so nearly half my decor right now came from her. If you haven’t checked out all of my letterboard signs (mostly ideas from Pinterest), be sure to click here. It’s odd how much pleasure I get from making those crazy signs. It’s one of the very few things I really do for no reason other than the simple fun of it all. Hopefully this will make our home feel more like fall. 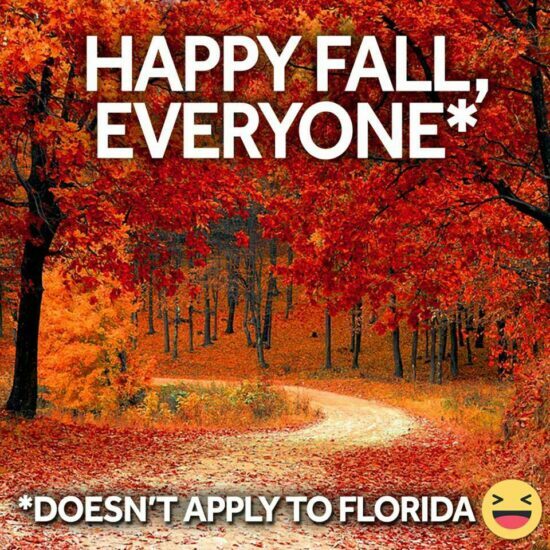 After all, it’s Florida, and despite the first day of Autumn having come and gone, it’s still 90+ degrees. We can just enjoy memes that go around Facebook, like the one below, I guess. Previous Post: « Sunday carbs don’t count. Those are the Lord’s carbs and He wants you to be happy. 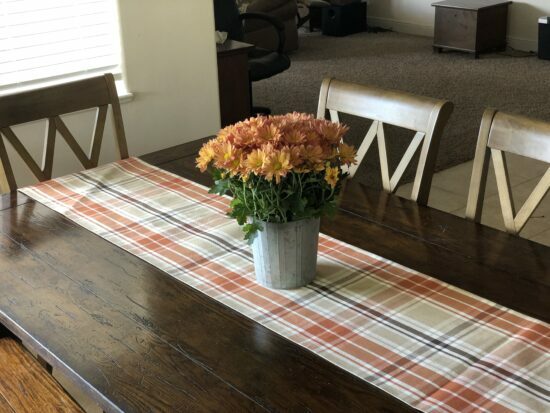 Your Fall decor looks lovely. What an awesome BFF you must have. 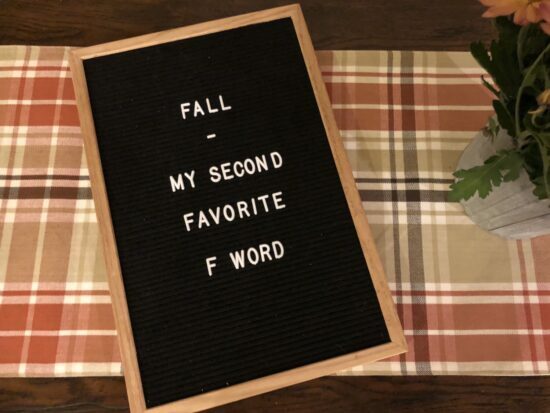 Fall is my favorite F word. 😉 I did not know about the interchangeable insert door mats. What a neat idea. Yeah she’s pretty great! LOL! Do you have more hours in the day than I have? Also is “Florida” your first favorite F word?